If you hired contractors to perform work for you, you will have to create a 1099-MISC form for each contractor that you paid $600 or more to over the course of the year. These forms have to be mailed out to your contractors before January 31st and filed with the IRS before February 28th (March 31st if you E-File). Traditionally, you have a choice of paying someone to create and file these 1099-MISC forms for you, or you could order blanks from the IRS and fill them out yourself — the first option is expensive and the second is inconvenient. Fortunately, there is a third option made possible by Intuit. 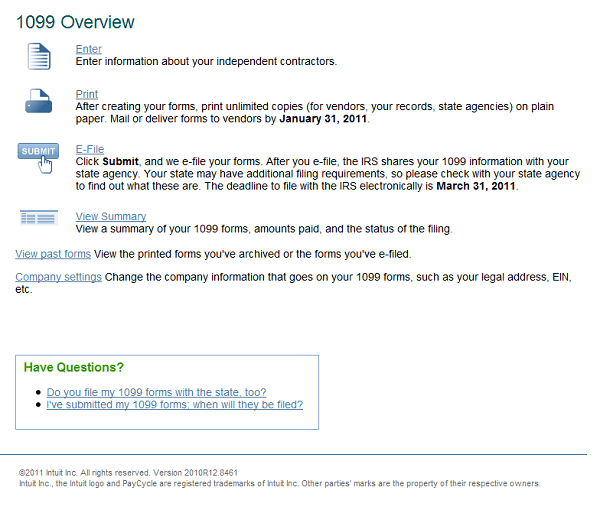 Intuit provides a 1099-MISC E-File Service that lets you create and print 1099-MISC for all your contractors and automatically file them to the IRS. Currently, they are running a promotion and the service will only cost you $25 before January 15th ($39 afterward). This is the option that I went with for my business. The service is very easy to use. To give you an idea how it works, here’s a brief walk-through. Go to the sign up page and click the “Sign Up Now” button. Agree to the Terms & Conditions, then proceed to the next step. Enter the amount paid in 2011. Intuit default this to Box 7, which is the most common and usually the only box you have to fill. If you need to enter more information, you can expand the field to show all boxes. When you finish entering all the 1099-MISC forms, select Continue and enter your credit card information Once you approve the payment, you can print the 1099-MISC forms and send them your contractors. You can also print out another set for your record. Since it is fairly simple to print these forms as a PDF file, I sent each of my contractor a PDF file to review prior to E-Filing. You can use free software like Primo PDF to break up the larger file you get from Intuit. The final step in the process is send Copy A of Form 1099 to the IRS. This step is very simple. All you have to do is click on E-File and then Submit. The service will automatically send all the necessary information to the IRS. Here are a few important things to keep in mind. You can wait until a few days before March 31st to submit. This is a good idea because you can’t make any correction once you E-File through Intuit’s service (but you can continue to submit additional 1099s up until the IRS e-file deadline). You must check with your state tax agency about additional 1099-MISC requirements. The IRS will share your 1099 information with your state tax agency, but you may have additional state reporting requirements. If you E-File, you do not have to submit Form 1096 — it’s not required when you E-File. Reveiwed and updated January 10, 2012 for 2011 tax year.